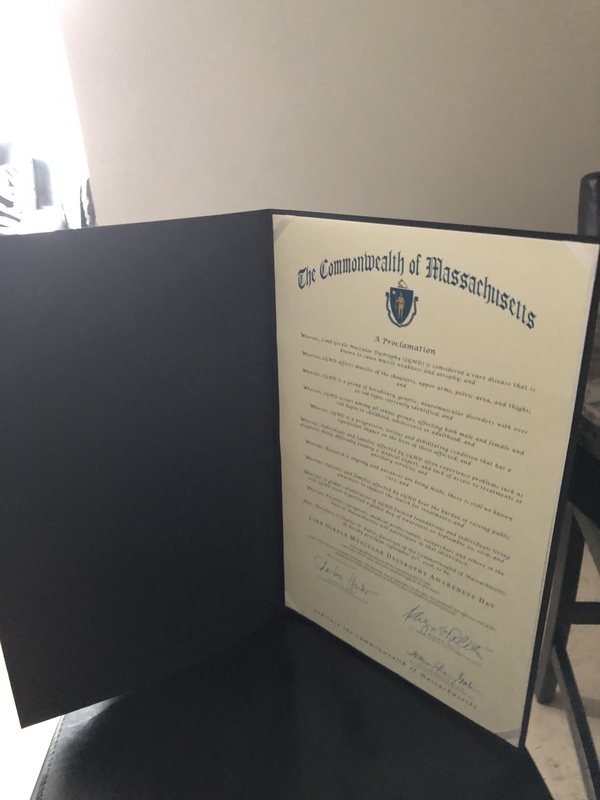 "Proclamation from the Mayor of the City of Cambridge"
Last year, I had the awesome opportunity to bring Limb Girdle Muscular Dystrophy Awareness Day to my hometown of Cambridge, Massachusetts as an official state ambassador. After taking the step to find and connect with other young adults living with MD, I found a facebook page, as well as groups and an informative website that all help individuals with MD talk, connect and share stories and resources specific to what each person is experiencing while having Limb Girdle MD. More than 20 people are currently in my support group. My friends here in Boston have a different type of MD, but can still relate to a lot of the daily challenges. Being able to just talk about what we are going through was and will continue to be priceless. I decided last year to take a leap of faith and reached out to my mayor and governor to declare the first LGMD Awareness Day last September 30th. 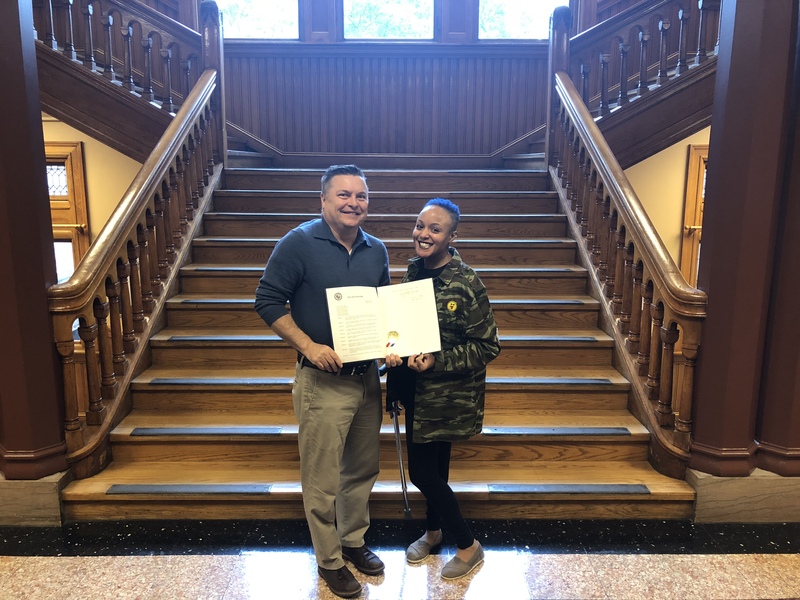 I was able to go into the Chamber Officer in City Hall of Cambridge to give my testimony about what LGMD was and how it affected me before receiving a signed proclamation from Mayor Marc McGovern. Now, the time has come again, and I want to help you spread the word and gain understanding about LGMD in hopes that others will start to spread awareness about chronic illnesses of all types. What is Limb Girdle Muscular Dystrophy? 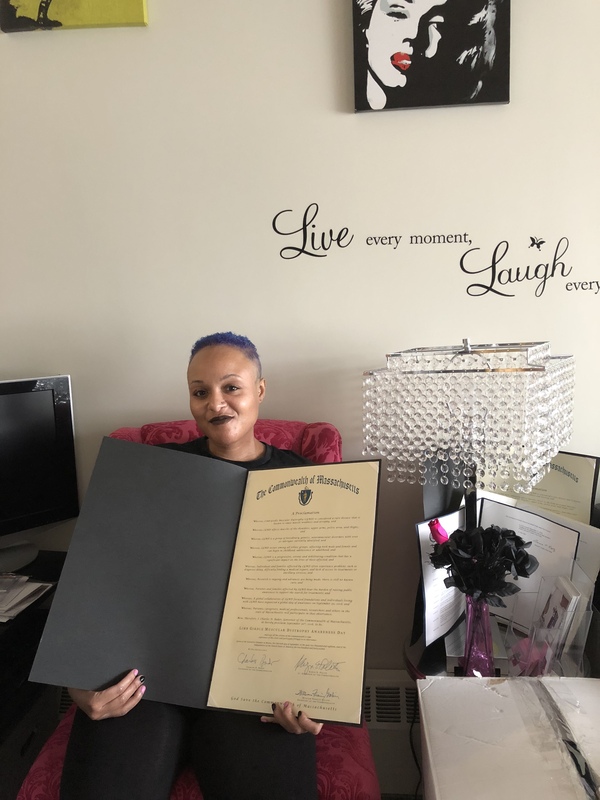 "Proclamation from Governor Charlie Baker"
What makes it different: It affects my limbs from arms down, putting on a jacket, and even raising my arms up fully can difficult for me. Even giving someone a hug can be a challenge especially if someone rushes to embrace me and potentially knock me over. In the morning and throughout the day, rolling out of the bed is not as easy as able-bodied person. It takes me a lot longer to do simple tasks that the average adult can do with ease. Low seating, windy days, uneven pavement or gravel surfaces and even holding a cup can all be challenges to someone with LGMD. What symptoms I live with: Lately, I have been experiencing back pain which means it’s time to go back to physical therapy to learn some restorative stretches and workouts to keep my pain at minimum throughout the day. At this point, walking with my cane is getting uncomfortable so getting a walker is an idea I will test out in the coming weeks. I see (3) different Neurologist and like getting each different perspective. Once I get my walker, I plan to pimp it out of course Girls Chronically Rock style. I took (4) different tests and still haven’t pinpointed the exact sub-type I have. I get Echocardiograms (Echo) once a year to stay on top of everything going on in my body. How its treated: The only treatment is physical therapy (pool), even that is getting difficult to get out the water and change clothes. Through my process of dealing with LGMD, I have learned that the pool is the best treatment for moving my muscles in addition to physical therapy. I’m working on getting a PCA to help me continue all the everyday things that have become a challenge or unrealistic for me to try and do on my own. Why Research and Community are Key to Our Success: Without the help, support and empathy of my group members, I wouldn't know how to travel well with MD, how to make it through rough days or how to face the many obstacles that come with this condition. Having the information is just one side of the coin. Having a community is the key to having the right information and a wealth of opinions and first-hand experiences to help you live your best life informatively and intentionally. 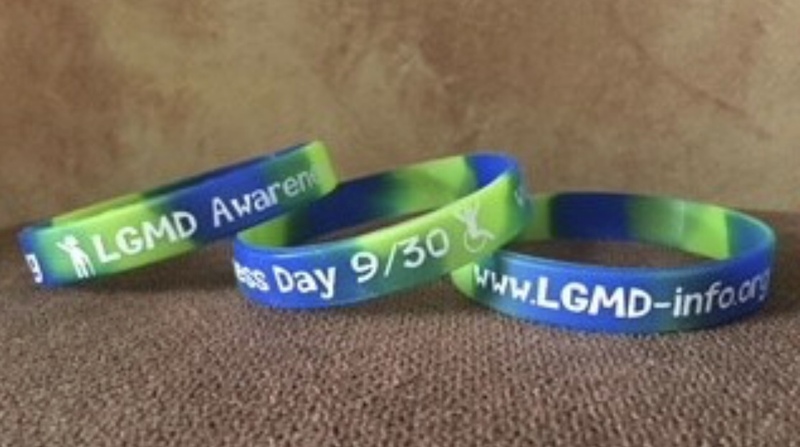 LGMD Awareness Day isn't just about me. It's about my friends, support groups and most importantly the early diagnosed versions of me who may feel all alone in light of a life changing conversation with his/her doctor. You are not alone. We are in this together. Spread the word. Spread the information. Spread the community.